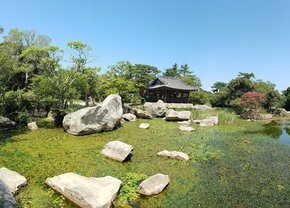 Yunseondo Grove is a representative garden in Choseon Dynasty. While Yun Seon-do headed to Jeju during the Manchu invasion of Korea, he was captivated by the grand scenery of this island and stayed here. Valuable Korean poems like 'Oebusasisa' were written here. Gosan was named Buyongdong after the blossoming of the graceful shape of Bogildo reminiscent of lotus flowers. He built Nakseojae at the foot of Gyeokjabong, the main summit of the island to reside in. He built three small tile-roofed houses in the East, West and Center. 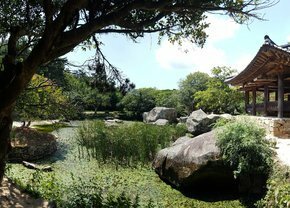 Until he passed away in Nakseojae at the age of 85, he built total 25 buildings and pavillions including Seoyeonjeong, Mumindang, Goksudang and Jeongseongam and decorated Buyongdong garden as a paradise of his own. Buyongdong garden is a living space or playing ground made by Gosan himself, and is a representative hermitage garden in Choseon Dynasty. While Nujeong collectively refers to a palace and a pavillion, Byeolseo refers to an isolated house near farm or field. 'Eobusasisa' by Gosan was written at the background of this Byeolseo. 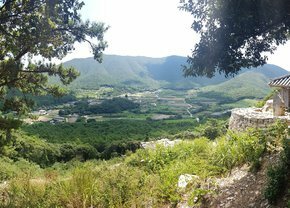 Today's remaining Buyongdong garden can be classified into three parts: near Nakseojae as a living space, near Dongcheonseoksil as a lounge space at the hillside on the opposite mountain and near Seoyeonjeong for playground at the entrance to Buyongdong. Likewise, Yun Seon-do distanced himself from the noise of political party strife but enjoyed elegant life in the paradise of his own. Here, he creatively wrote the simple life of a fisherman living with the nature.